Partners David Hartshorn (left) and John Farr (right) of Waitsfield, VT-based Green Mountain Harvest Hydroponics. Photo courtesy of Green Mountain Harvest Hydroponics. Like many great plans, Vermont’s Green Mountain Harvest Hydroponics operation began as a barroom conversation among friends. In the early 1990s farmer David Hartshorn and his now business partners, brothers John and Ted Farr, sat around discussing their dream of building a greenhouse to enable them to grow produce year-round. At the time, though, the energy costs required to bring the project online were so prohibitive that they tabled the idea. Approximately twenty years later, though, the timing was right. 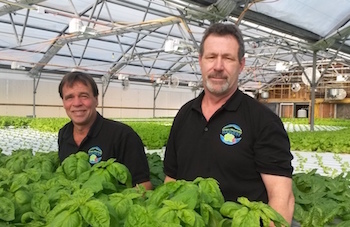 In 2013, with a loan procured from the Vermont Economic Development Authority, Hartshorn and the Farrs launched Green Mountain Harvest Hydroponics (GMHH) in Waitsfield, Vermont. With money from the loan, they purchased a used greenhouse from a flower grower in Colorado along with some Dutch-manufactured grow lights. GMHH’s first year in business was a little rough, and involved market testing and heavy experimentation. “We started out growing everything to see what would work,” Hartshorn says. The Boston lettuce did not grow well, the romaine was spindly, and kale, the darling leaf du jour, didn’t flourish. GMHH also grew a selection of herbs, but found that only basil yielded a large enough return. Hartshorn and his partner learned a lot that first year, and decided to refine and pare down GMHH’s crop offering to focus on the herbs and vegetables that the market desired—basil, watercress, and summer crisp lettuce. When GMHH introduced mixed salad greens to its growing trays, the farm’s team realized that it had found a winner. GMHH’s produce soon found its way onto the shelves of local Vermont grocery store including Healthy Living, City Market, and Hannaford; but it was an account with Whole Foods Market in Boston that really enabled the company to grow. Now in its third year, GMHH has its sights set on expansion by doubling the size of it current 11,000-square-foot greenhouse to a half-acre of growing space. The operation is also taking measures to increase sustainability and crop yields. GMHH recently spent $80,000 on LED lights to upgrade its lighting system. Hartshorn says, the higher efficiency LED lights will reduce the farm’s energy costs by 60 or 70 percent and allow for several more crop rotations, enabling the lights to pay for themselves in short order. GMHH also installed a heating system that it fuels with debris from the Farr brothers’ tree service. As demand for year-round local food availability in Vermont and the New England region continues apace, the future appears bright for Hartshorn and the team at GMHH.